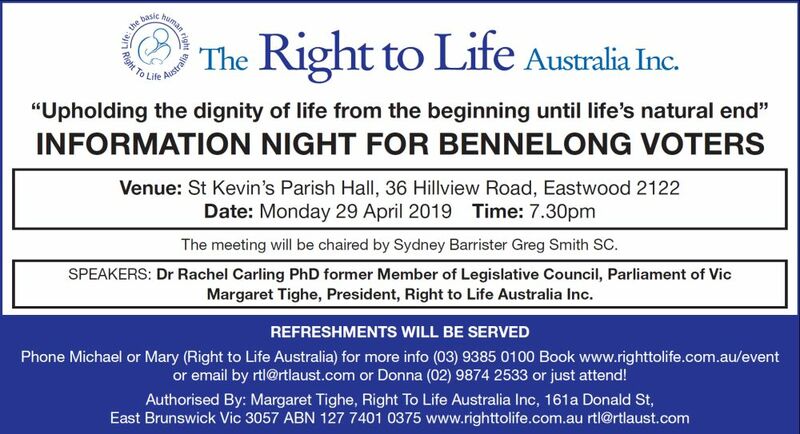 The Right to Life Australia Inc. defends the right to life of all human beings from conception until natural death. We work to protect the most vulnerable in society – the unborn baby, elderly, sick and those with disabilities. Right to Life Australia provides free telephone counselling to women facing crisis pregnancies through our 24 hour telephone counselling service on 1300 737 732. We offer support to help women at a time of need, to enable women to make life affirming decisions . We are dedicated to educating all Australians about the responsibility of providing protection to the vulnerable in all aspects of life.